A Few Scraps: Giveaway Day: I'm in Quilts and More! Giveaway Day: I'm in Quilts and More! Hey everyone! Happy Giveaway Day! Months ago I submitted a quilted tote bag to Quilts and More and they accepted it! It's in the issue that's out now, the Summer 2014. I made the bag with Waterfront Park by Violet Craft and Cotton Couture solids in Clementine. My giveaway is a copy of the magazine and the fabric needed to make my bag. I've even got the right amount of strap for you here. All you need is batting and thread! And the willingness to try free-motion quilting. And I know a really good free-motion quilting book if you need one (wink). The giveaway is open to everyone all over the world. It will close on April 16 apparently it's May, so how about May 16th? To enter please just let me know your favorite color right now. I'm in a colorful mood today. The giveaway is closed and the winner is #125 Elsa! Thank you all for sharing your color love and congratulations and the nice thoughts about my book too. Such a cute bag! My favorite color is purple! My favorite colour is red. I have just started teaching myself to free motion quilt, so this bag would make a great beginner project. Teal is my favorite today! Tomorrow it may be something else! Love the bag, I'm loving Yellow right now. I really need to get over my fear & try FMQ...maybe this would be a good project to give it a go!?! Thanks for a chance to win and congrats on the magazine! Beautiful bag, my favorite color is green. My favorite color right now is orange - don't ask me why, but it makes me smile! Congratulations on the publication - that's awesome! If I don't win, I'll be looking for a copy of the magazine for my collection. I love being able to say I "know" someone whose design is in the magazine! I'm on the hunt for the best non-muddy, non-eggy yellow. I love that bag! My favorite color right now is bright coral! It's so summery. My favorite color is red and I am definitely a bag lady! My favorite is turquoise. Thanks! My favorite color is purple, today en tomorrow :-). But I love the orange bird fabric!!! Favorites colors orange/yellow and purple. Cute bag. My favorite colors have to be corals and teals. I don't use these colors often but I love how the just go together. congratulations on your publication!!! Violet Kraft is one of my favorite designers and my favorite color right now is a pinkish coral. Thanks for the chance to win!!! I love a good orange :) congrats on being published! Congrats on the magazine article. I'm liking purple these days. Ooh fun! I love new craft magazines! My favorite color has always been RED. The hexie fabric is cute! Congrats on being in the magazine. Also, thanks for the chance. My color of the moment is definitely orange. Somehow it's finding its way in to just about all of my projects the last few months. My favorite color is changing every second. But now...Coral! I love bright blue! I always seem drawn to it especially when I am sewing! Thanks for the opportunity! My fave colour is always green... and teal... and grey... and white.... and navy :) Happy giveaway day!! I love coral. And aqua. Right now? Well at this moment a rich warm violet is what I am picking. Generally my favorite is a blue with a hint of green in it. Orange is the best color. Congrats on being published! I like yellow a lot right now. Congrats on your magazine feature! What fun! I'm loving purple at the moment! Thanks for a chance to win! blue or orange as of today. That may change tomorrow. I seem to use orange in everything right now. Orange and teal or aqua. Purple is my all-time favorite! I love seeing great purple fabrics come out! Love the bag! Currently orange is my favorite color. thanks for a chance to win. My favourite colour is turquoise. My favorite color happens to be orange! Congrats on your bag being published. I like the color purple right now. I was inspired by a quilt my friend was putting together of purples. Very pretty! Aqua would have to be my favorite color! Thanks so much for the chance to win, and congrats on the publication! I love Navy! Thanks for the opportunity! Congratulations on being published. Yeah!! I would say my go to colour at the moment is denim. Really like navy. Love the tote. I am a big time purple fan! Great giveaway! My favourite colour is purple. Congratulations, Quilts and More choose well, and my favorite cool is red. Thanks. Red is my all-time favorite color. Thank you for your generous giveaway! Your tote is so gorgeous. Thanks for the chance to make one. I love pinks! congratulations! That is SO exciting! I definitely have my fingers crossed. Congratulations. My favorite of the moment is teal. Loving pink, I think it is the granddaughter influence!! How exciting, congratulations! I'm turning into my mother, which is a good thing, I love green! Love the tote, right now I have been drawn to navy. My favourite colour of all time is plum. It's also great in combination with so many other colours. Love the tote! My fav color right now is peachy apricoty orangish hues. Grey, I always love grey, but right now coral too! Thanks for sharing with us. Right now, I'm loving a color that doesn't usually appeal to me--purple. Love following you on Bloglovin. Cute bag. My favourite colour at present is teal - using it in accents to decorate my new home. Thanks for the giveaway. My favorite is maroon. Thanks for the chance to win! I love the color aqua right now! I have been really drawn to gray and yellow fabrics lately. Thanks for the great giveaway. Beatiful! My favorite color is aqua/turquoise! My favorite color is blue..Congrats on being published in the latest Quilts and More! Today I am loving aqua. Congratulations! It's hard to pick one fav color but I'm really liking teal right now. Thanks for the giveaway! Saffron is my favorite these days. And I, too, keep forgetting what month it is. That dark teal/jewel-tone blue you have in the bag kit is my favorite color, actually! Great giveaway... thanks for the chance to win! great bag! I'm really liking turquoise these days. Orange and blue in combo. i love your book! my favorite colors to quilt with are orange, aqua, and red. i love the orange in this bag....great color combos! way to go! thanks for the give away! 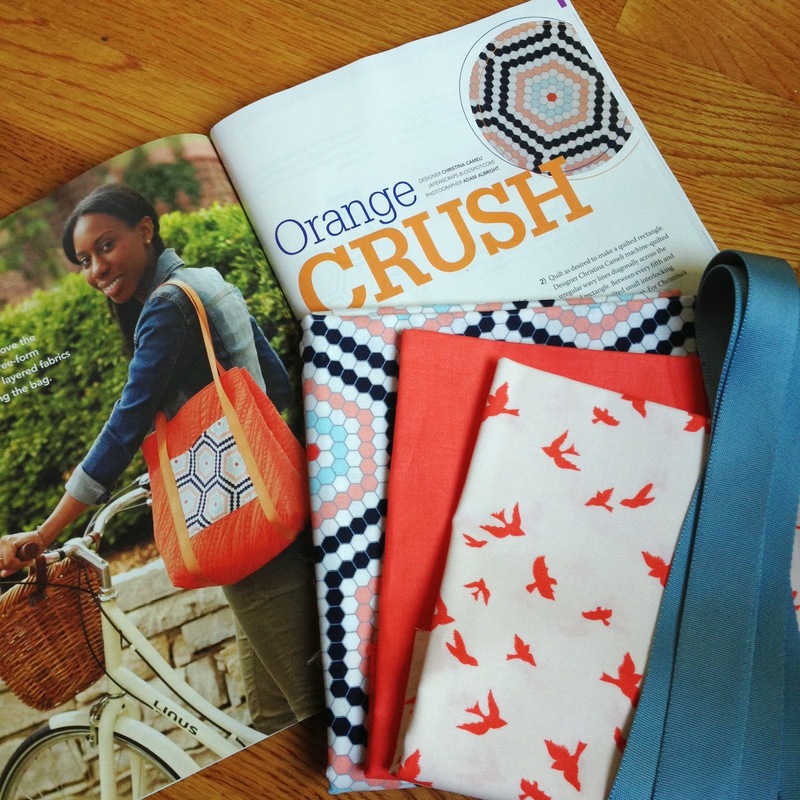 Looks like a cool bag - thanks for the chance to win the kit to make one :) I'm loving orange at the moment and throw in a little lime green and I'm pretty much in heaven !! Aqua - I just never get tired of it! My favorite color is BLUE!! Congrats on your magazine feature!! My favorite colour is blue!!! Good morning, from tornado, stormy Michigan, my favourite colour right now is clementine. My favorite color right now is orange- a color I previously thought I did not like!! Am making my first "orange" quilt and lovin' it! congratulations on having your patterns published..
Beautiful bag Jen!! My favorite color is blue combinations. I'm a real bag lady too and I'm ready for a new one. Thanks!! Aqua is my favorite today! Thanks for the chance. I love the bag. I love them all, but purple has a slight edge. Thanks for the opportunity to win. Beautiful bag! I love your book and would love this to be my first free motion quilting attempt (have your great book; now just need the sewing machine attachment and a bit of courage). Sweet giveaway! Favorite color(s) right now are yellow and orange ~ I can't pick one without the other. Thanks so much for the chance to win this great prize!!! Today it would be aqua! Congrats on the publication! Those are awesome colors. Right now my favorite color is aqua verging into turquoise. Just seems to be the epitome of summer! How cool to have your bag in the magazine! Is polka dot a color? If not, I'm digging teal right now. My favorite colors are red, green and orange!!! Turquoise is creeping its way in though. I love color!!! My favourite colour (right now) is green. I think this is wishful thinking for summer. I love the bag! And I'm definitely going to need to check out your book. Red is my favourite this month! My favorite color is a warm yellow, almost orange. My favorite color is purple. I really like that bag. I'm feeling red right now. It's really making me happy. Gorgeous giveaway, I'll give FMQ a go! My favourite colour is blue. My favorite color is orange and thank you for the great giveaway! I'm loving orange and teal right now! Congrats on being published! Thanks for the giveaway. My favorite is blue especially the shades close to aqua. I love the tote! My favourite colour is green. I really love all colors but am drawn to red most often. love the tote. LOL, How did it become May so fast ;) mmmmm... right now digging yellow, changes by the second. My favorite color is purple, but all those lovely seaglass colors are also calling right now. Many thanks for the chance to win this set! I am a big fan of orange ..
One of the colors I never liked...was orange...but somehow it's been growing on me and I've been adding it to my stash. It's such a happy color -- especially since we've been having much too much winter here in Calgary, Alberta...I want to see the sun and happy colors! Aqua is my current favorite. I love the navy and peach right now..
At the moment my favorite color is an aqua blue--which happens to be the color to my toenails right now! Wonderful bag. Would love to make it. Thanks for the chance to win. My favorite color never changes...it has always been blue! Favorite color is, has, probably always will be red. Also in love with grey, aqua/teal and purple. Loving aqua right now. Congrats on appearing in the magazine! I have your book too. Still need to sit down and get into it though. Blues, love blues. Thanks. Cute bag, Congrats. Purple is and has been my favorite color. Put it with oranges and POW! Blue always has my heart, but lately I've felt very drawn to orange. Teal is my favorite color! I am loving navy blue right now . What a great bag , I love to make bags ,thanks for the chance . My favorite color is aqua, followed by most clean shades of green and blue and any combination of the two. Green is always my favorite color! That's like asking which is my favourite child! But, I'll admit that I do tend toward brights. The brighter the better. My favorite color right now is light turquoise. Green is my favorite color - thanks for the chance to win.